Dragons, Unicorns & Mermaids traced the natural and cultural roots of some of the world’s most enduring mythological creatures from Asia, Europe, the Americas, and beyond. Visitors touched casts of a narwhal tusk, the lower jaw of Gigantopithecus, and a life-size reproduction of the talon of a Haast’s eagle. 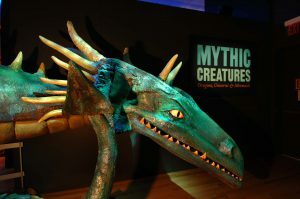 Dragons, Unicorns & Mermaids offered many interactive stations throughout the exhibition. Visitors built their own dragon on an engaging touch-screen and watched it come alive before their eyes in a virtual environment. This amazing exhibition included imaginative models, paintings, and textiles, along with other cultural objects from around the world. 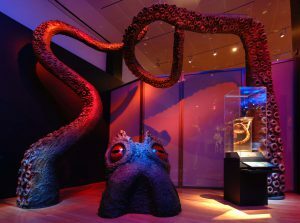 This exhibit brought light to surprising similarities and differences in the ways people around the world have been inspired by nature to envision and depict these strange and wonderful creatures. This exhibit ran from November 11, 2017 through May 20, 2018. This exhibit was brought to you by the citizens of Kent County and the voter approved 2016 millage.